If you don't already have a Maven-aware version of Eclipse, you can download the SpringSource Tool Suite (STS) which will support these projects out-of-the-box (STS even includes support for the OSGi-enabled samples). Alternatively, you can manually add a Maven plugin, such as m2eclipse to an existing Eclipse installation. 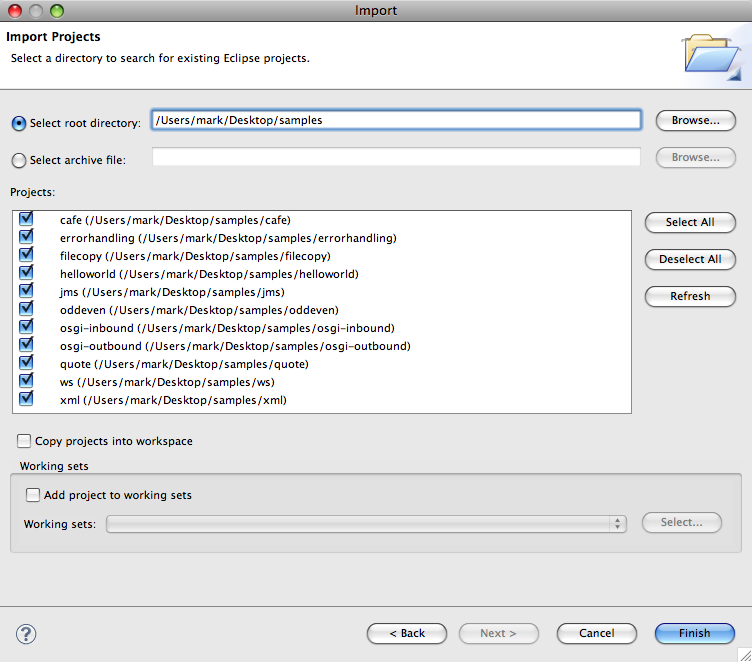 Download the Spring Integration Samples and unzip. *NOTE: if you import the ‘osgi-inbound’ project, you will see some errors on that particular project (but you should not see any errors on the other projects after the workspace build completes). Those errors would be resolved after configuring the runtime and the bundle repository. If you would like to work through the OSGi samples, refer to the dedicated chapter in the Reference Manual. Also, we will be posting a blog that goes into detail on those projects within a few days. Each of the samples has a main method within a “Demo” class (except for ‘osgi-inbound’ and ‘osgi-outbound’ which are meant to be deployed within an OSGi environment - to be covered in that upcoming blog post). For example, the ‘helloworld’ project has ‘HelloWorldDemo’. In the javadoc of each demo class, you will find a brief overview of features showcased in that individual sample. Message: Spring Integration Messages encapsulate a POJO payload and a header Map (Reference). Message Channel: Spring Integration includes many Message Channel options for both point-to-point and publish-subscribe. Some include queues for buffering while others dispatch directly to subscribers (Reference). Message Endpoint: At a high level, this includes all components that connect to channels for input and/or output. Messaging Mapper: Spring Integration binds inbound Messages to method arguments and method return values to Message payloads and/or headers. Message Dispatcher: In Spring Integration, channels that do not have a queue use Message Dispatchers to invoke their subscribers. Pipes and Filters: This is the most general pattern describing Message-processing components connected in a loosely-coupled way via channels. Message Bus: Spring Integration essentially turns a Spring ApplicationContext into a lightweight Message Bus within which all of these other components are hosted. For more detailed information, check out the Samples chapter of the Reference Manual and the README file located directly in the “samples” directory of the main distribution. 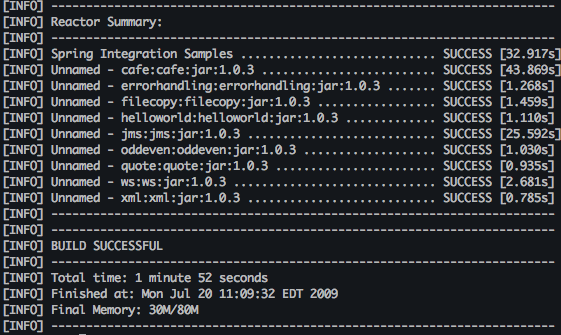 Also, stay tuned for another blog covering the new OSGi based samples added in Spring Integration 1.0.3. That should be posted within a few days. Last but not least, be sure to check out the “POJO Messaging” sample from the Spring BlazeDS project (see the build and run instructions in the Spring BlazeDS Reference Manual). That demonstrates Flex Producer and Consumer elements whose “destinations” are backed by Spring Integration Message Channels.